The Lamiaceae are anything but lame. Most of its members are herbaceous plants with SIMPLE, OPPOSITE leaves and SQUARE STEMS. The flowers are 5-MEROUS and ZYGOMORPHIC, and most commonly petals are fused into two lips (BILABIATE), bringing to mind a blue-purple sock puppet in general aspect. As seen in the photo above, the upper lip is often much REDUCED and the broad lower lip may have coloration patterns that act as NECTAR GUIDES. The CALYX can vary from two-lipped to regular and is often a more reliable character for keying purposes because the petals fall off quickly as the fruit develops (Michigan Flora). The flowers have 2 or 4 EPIPETALOUS STAMENS. The ovary is DEEPLY LOBED and looks like a 4-pack of hot cross buns when views from above. The ovary lobes develop into 4 NUTLETS. 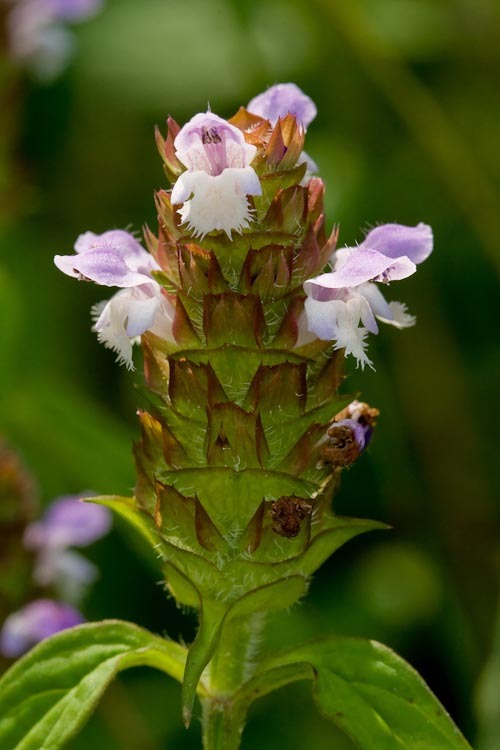 The inflorescence is either a terminal spike, as in bugle weed (Ajuga reptans), or a +/- tight axillary or terminal cluster of flowers, as in wild basil (Clinopodium vulgare), bee balms/ bergamots (e.g. Monarda fistulosa), and mint (Mentha arvensis). Mint flowers are most often purple or white, or some combination of the two. One of the easiest ways to tell a member of the mint family is to crush a leaf and take a whiff. 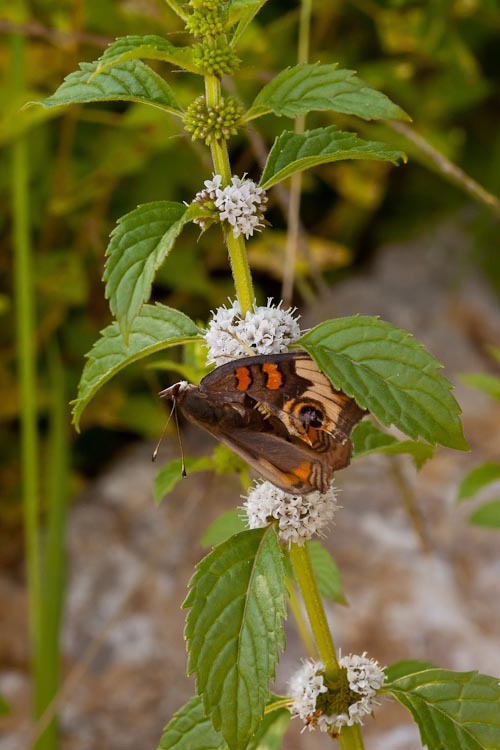 The stems and flower parts of many species are dotted with resin glands that seep aromatic oils, making them pleasant additions to your garden, your tea cup, or your kitty’s diet (catnip, Nepeta cataria). Some specialist bees visit mints to harvest oils, as well as nectar and pollen. Many mints appear as cultivars in flower gardens, including salvias, bee balms, spearmint, and lemon balm. Mint oils have been used medicinally and as an antiseptic in different parts of the world. 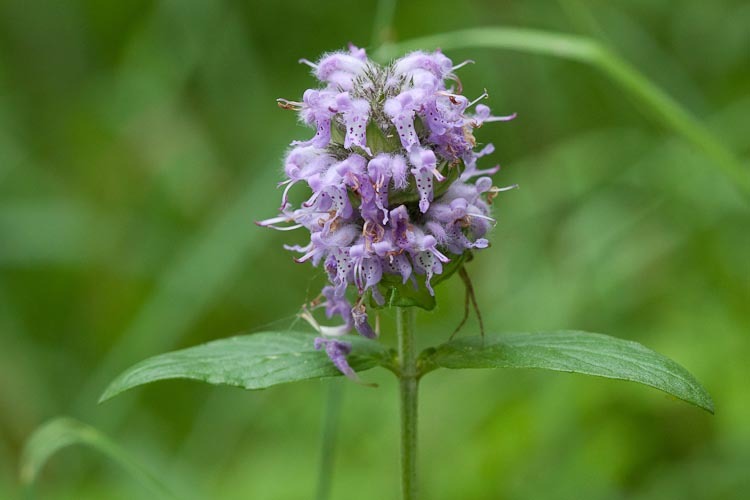 Mohegan Indians used catnip tea for colds, and dairy farmers in parts of the midwestern United States use local mint oils to wash their milking equipment. As a result, mastitis, a common disease of dairy cattle, is seldom encountered in their herds. 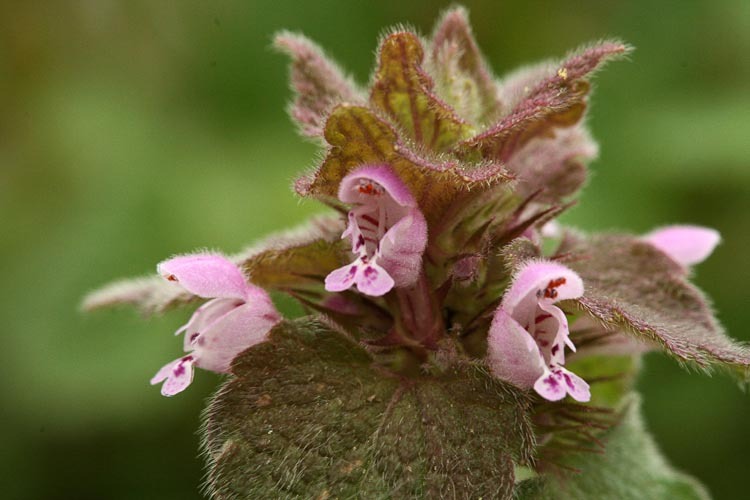 Horehound, a common mint weed of Europe, has become naturalized on other continents and is cultivated in France. A leaf extract is still used in horehound candy and cough medicines. Another relatively odorless mint is chia, whose habitat is confined to the drier areas of western North America. Chia seeds have been said to contain an unidentified substance with caffeine-like effects. Before the turn of the last century, a physician named Bard maintained that a tablespoon of chia seeds was sufficient to sustain a man on a full-day hike. Since that time, backpackers have experimented with the seeds and indeed found them to be nourishing and helpful for endurance. (Medicinal information, wacky as it is, is derived from the botany textbook Introduction to Plant Biology, 8th. edition, by Kingsley R. Stern published by McGraw-Hill in 1999). 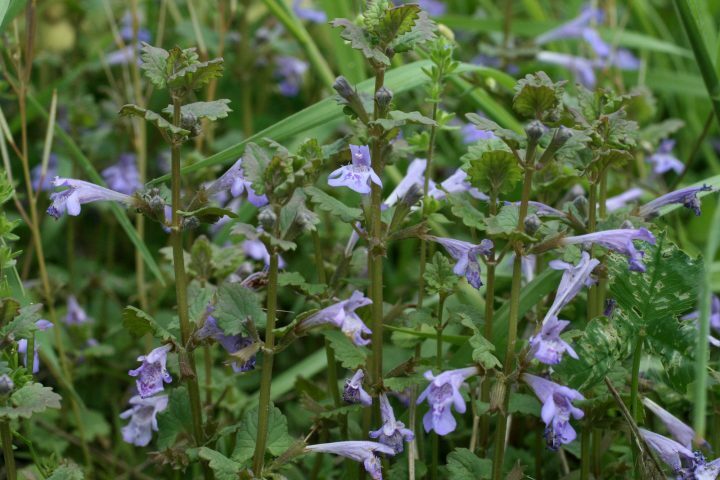 This is arguably the most abundant mint in Ohio, Glechoma hederacea (gill-over-the-ground or ground ivy). It is a weedy, aromatic, creeping plant with tiny purple flowers. Lamium purpureum (purple deadnettle) is a small pink-flowered mint of disturbed places, like edges of lawns and sidewalk cracks. As seen in the photo above, the leaves often have a reddish cast to them. The inflorescence seems disproportionally small relative to the rest of the plant. 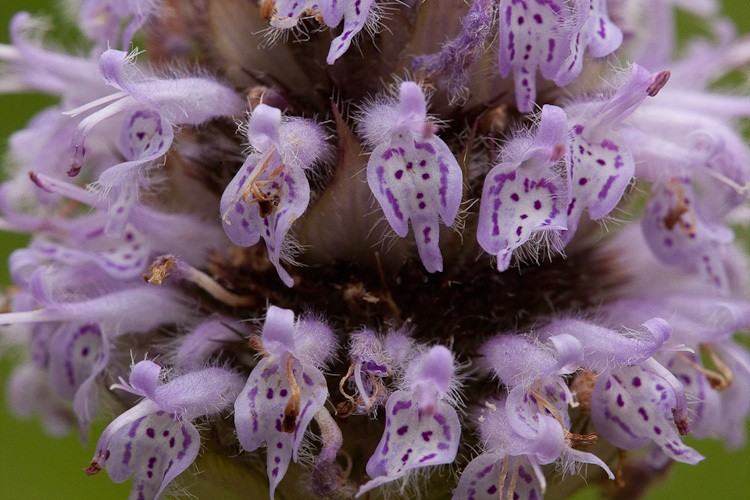 Prunella vulgaris (self-heal or heal-all). Originally native to some places on the North American continent, but now widespread in disturbed places. Is easily recognized by its squarish cone-like inflorescence. Mentha arvensis, wild mint. Fragrant weedy plant of many habitats, with axillary clusters of flowers. When plants flower serially like this, from the bottom (oldest) up, bees can be seen working over the whole plant moving from the bottom up or top down to keep track of which flowers they have already visited. To me, it would make sense if they visited top down, because the newest flowers are more likely to still contain nectar. 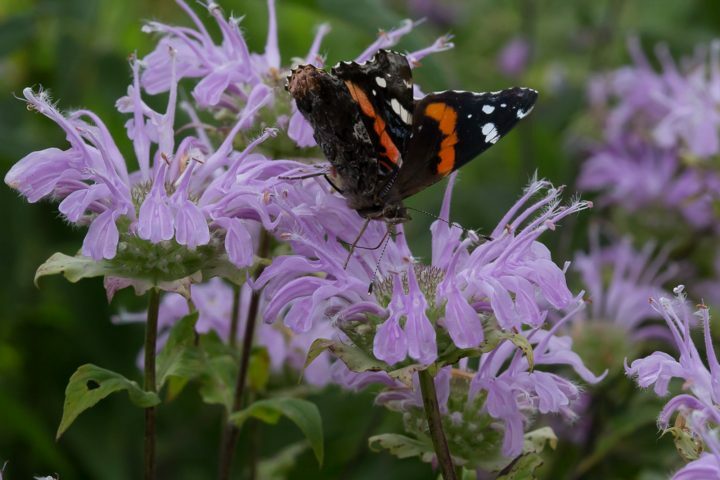 Monarda fistulosa, wild bergamot, produces a terminal cluster of lilac-colored flowers in early summer. 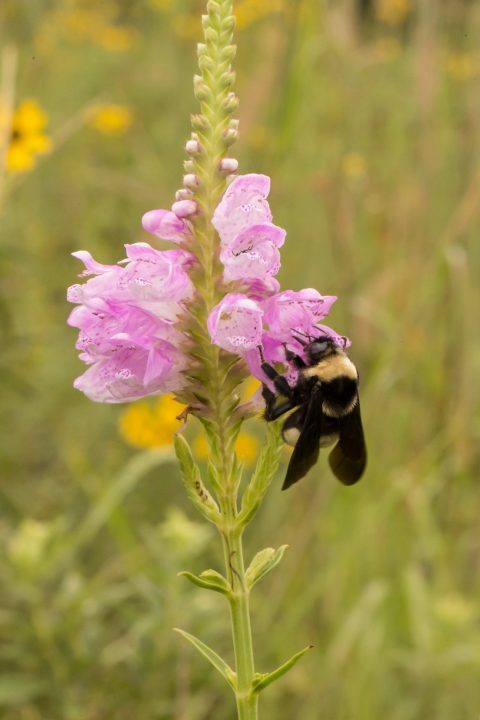 It is a hardy plant and is often planted in gardens and prairie restoration projects because of its attractiveness to pollinators. 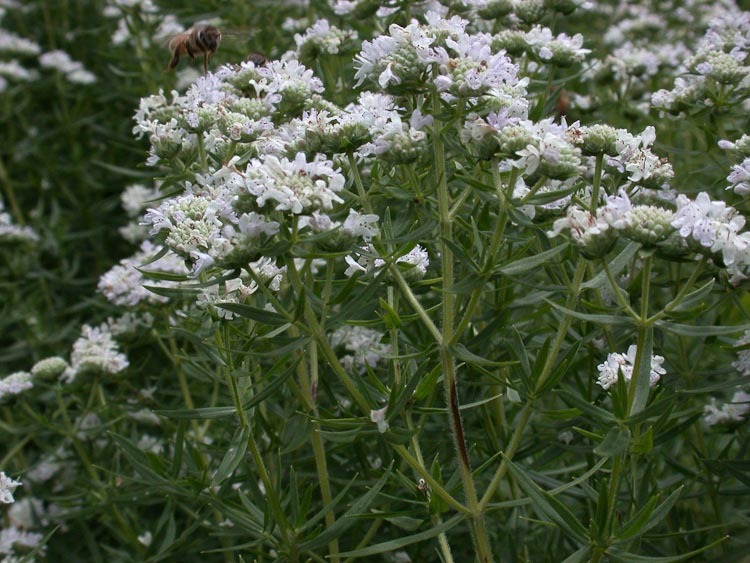 Pycnanthemum virginianum (Virginia mountainmint) is a another plant that is highly attractive to pollinators, though rarely found growing wild in Ohio. Pycnanthemum muticum is more commonly found here along edges of woods in early summer. In the photo above, a honey bee is approaching a flower. Pycnathemum spp. produce copious amounts of nectar that attract many guilds of pollinators, which results in large amounts of tiny fruits (mouse over image). Blephilia ciliata, downy pagoda plant. B. ciliata and B.hirsuta are common mints that grow along the edges of woods and flower in early summer. 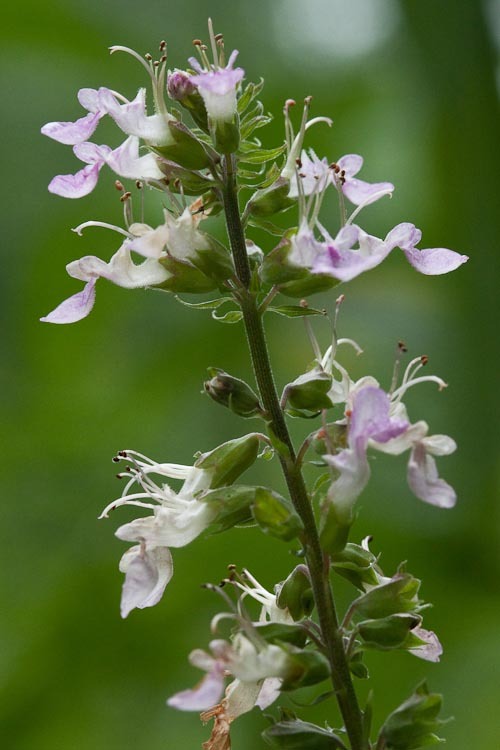 Teucrium canadense, Canada germander or wood sage, is a robust plant with pale purple-pink flowers in late summer. May be weedy in some places in the U.S., but plays nicely with others in Ohio. Seen growing in large patches along roadside ditches in late summer. 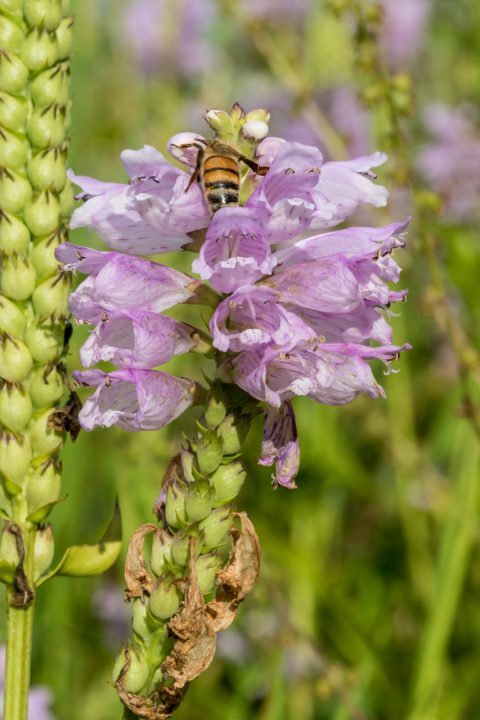 False dragonhead, Physostegia virginiana, is also called “obedient plant” because the flowers, when pressed to one side, stay there instead of springing back into place. 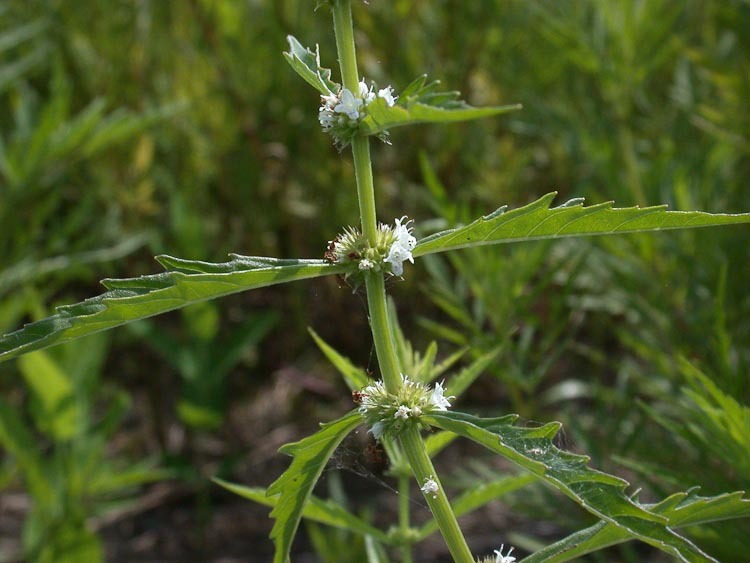 Lycopus americanus (water horehound) is a common, at times weedy, mint of wet places like the edges of marshes or woodland pools. Note the axillary clusters of small white flowers and coarsely blunt-toothed leaves. Scutellaria incana, hoary skull cap. Scutellaria spp. is genus of woodland herbs that are usually found on floodplains and the edges of wetlands that are not saturated year round. They are not rare, but not abundant either. 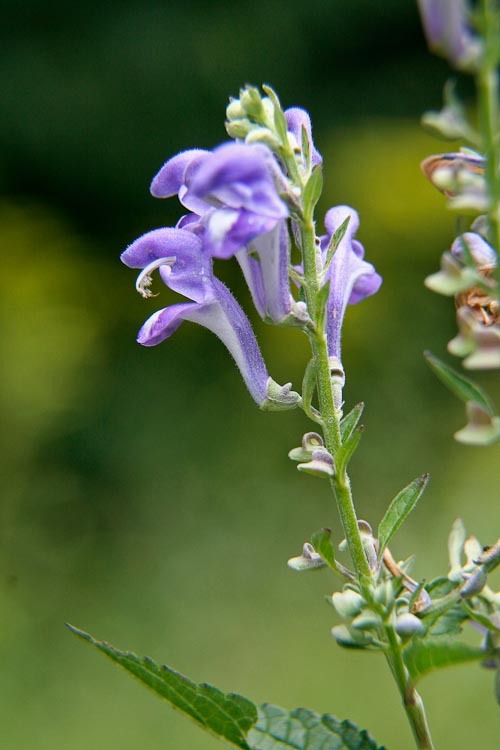 The most common species is mad dog skullcap, S. lateriflora. False dragonhead, Ohyscostegia virginiana, is a wetland member of the mint family. 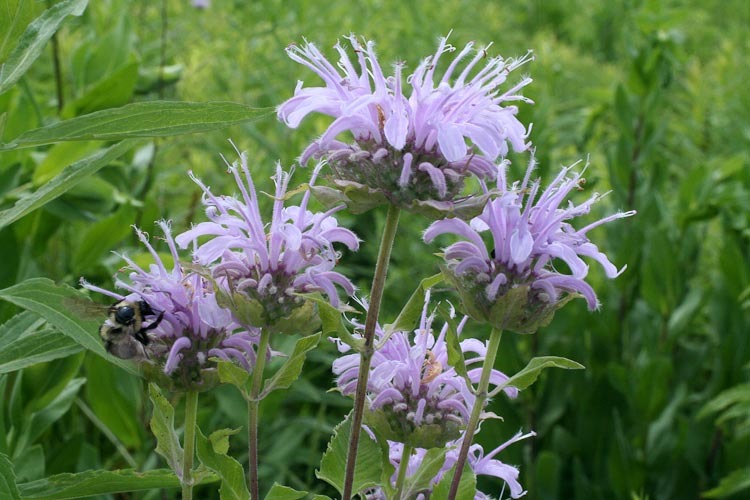 Wild bergamot, Monarda fistulosa, is a prairie wildflower. 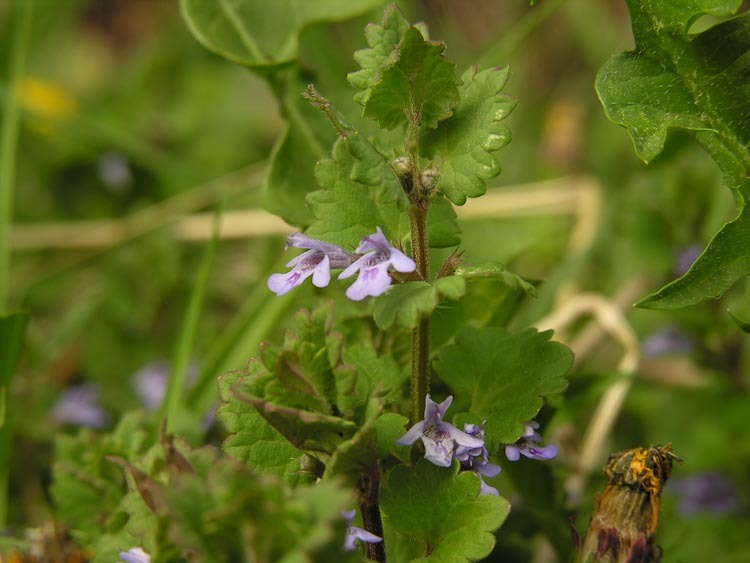 Gill-over-the-ground (ground-ivy, creeping Charlie) is a common lawn weed in the mint family.